IF RORY McIlroy brought a single demon back here to where this time last year some feared his career might have been destroyed before it truly began, all the evidence is that the little blighter did not make it through US customs. Another possibility is that having seen the assurance with which an apparently broken 21-year-old has returned to the scene of his torment, the coolness he is displaying before a duel with Tiger Woods that is being described with increasing frequency as the "only story in town", the demon has simply scampered off into the pine trees. What was absolutely certain yesterday was that McIlroy looked about as vulnerable as some gnarled old champion who knows every inch of his game's trickiest terrain. No, of course, he was quick to say, such a declaration would be somewhat premature despite the splendour of his redemption a few months later at the US Open, but the truth about himself he was willing to claim is that he may just be one of the quickest healers in the history of a game which so often distributes wounds that never go away. The suggestion came in his sure handling of the huge pressure of expectation building around him here these last few days. He borrowed one phrase from the teenaged Boris Becker who greeted the loss of his Wimbledon title with the philosophical aside that no one had died out there on the Centre Court but the rest was mostly the musing of a young man of considerable self-awareness and humour. "I think as golfers we understand that we lose more than we win. We only win a number of times and every other time we are not lifting the trophy. It's not a failure but you don't win, so maybe you have to get used to living with some disappointment. "Maybe I've just got the mind-set that I handle it a little better than others and looking back to last year I think maybe the vital thing was that I understood through all the disappointment that I had many more chances to win a major or a Masters. It's only golf, you know." Only golf, only the business which has elevated him to the point where many previously sober judges are insisting here before the 76th Masters that if it is not to be Tiger dressed in his fifth Green Jacket it must be McIlroy in his first. "You have to remember," he says, "that there are 80-plus players in this field. It's not just about two or three guys or whatever. Every guy has just to think about themselves and try to play the golf course as best they can. You just have to concentrate on yourself. "It's nice to be getting all this praise and everything but you have to take it with a pinch of salt. I'm nowhere near the achievements of Tiger or the level of success he has had over the last 15 years. Hopefully, I'll get somewhere close to that point." If that might be a version of golfing heaven, it is one which McIlroy insists can wait. There is, he says, an obligation also to enjoy the experience of the journey, the sense that there is a pleasure to be had that these last few days has never been more tangible. Augusta National threatened to be the killing ground of his best hopes, but he knows now that it will always be the place where he learned some of his most significant lessons, both as a golfer and a man. "I know I'm stronger now as both a player and a person and that has come to me very strongly this last week or so. Definitely a lot of things have changed in me over the last year. I'm the same person, I know, but the difference is my attitude. This is stronger. I came here last year hoping to do well - this time I come with a much stronger feeling about wanting to win, to get into contention and stay there." Last week over lunch in the clubhouse his feeling for the course and all that had happened on it down the years, he was a little surprised to learn, had become almost proprietorial. "This is my fourth visit here," he says, "and each time I feel a little more excited. I felt this so strongly over that lunch. You look out the back of the clubhouse and you see the first tee, the ninth green, the 18th green, down to the second, down to the seventh and you can almost see down to the 15th. Over a few years, you feel very much part of it." You cannot see the 13th from the clubhouse but McIlroy has a picture of it which is utterly indelible. "I just love the 13th," he says. "It is my favourite. I just love the tee-shot, love the second shot into the corner. It's probably one of the most beautiful holes in the world - and probably the most strategic is the eighth because you can get your drive away OK but the second is a very risky shot if you want to make the green. "You've got to take on the overhanging trees on the left and if not then you miss it right, leave yourself a very difficult chip shot to the green." It is to be reminded of the old line of Tom Kite, who once said: "What a great hole - it gives you a million options, not one of them worth a damn." Naturally, because of the time and the place, McIlroy is grilled relentlessly over that time between the nightmare of the back nine at Augusta and the brilliant new dawn that came to him a few months later at the Congressional Club. Yes, of course, there were a few demons to shoo away. He didn't fret too much on the 18th green because he had had five holes to absorb the most crushing disappointment of a largely charmed life. One morning a short time later he wept under the gentle probing of his mother as to his state of mind - and felt immensely better for it. Most liberating though was a call he took in his Malaysian hotel room from Greg Norman soon after the long Sunday afternoon. "It was great that he took the trouble to do it," says McIlroy. "It was great coming from him because he had been in the same position in 1996 and before then 1986, sorry 1987 - I wasn't born then. He knew how I felt better than anyone else in the world and he said a couple of things that I found very useful and put into practice during weeks like this, where there is so much hype and so much build-up. "You must try to create this bubble around yourself and get into it - and don't let any of the outside interference get in." Maybe the ultimate lesson, though, has been drawn from the man whose empire so many now expect him to inherit almost as a formality. 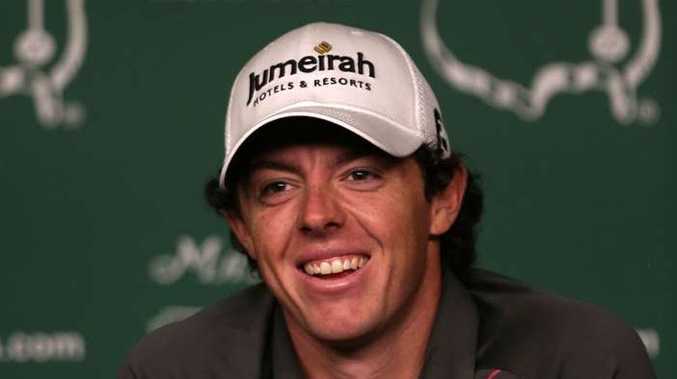 McIlroy smiles at the presumption and says, "You know, you don't win 14 majors and 70-odd PGA events for nothing. People are very quick to build players up and they are very quick to knock them back down. And you know a lot of people also have very short memories. The Tiger won the 2008 US Open on one leg. He can do things other people can't do." It left just one question in the brightening day. How well can Tiger move the last of his demons? He should know that the young gun at his shoulder appears to be doing a remarkable job.